GetTube – YouTube Downloader & Player v0.8.2.0 AdFree Apk is Here! Download or stream in background (in alpha release) your favorite YouTube music and HD videos, from 144p to 4K.GetTube is YouTube downloader that let you download videos from YouTube in any quality ranging from 144p to 4K.It has multithread downloader to offer fastest speed possible. Hassle-free pause or resume videos anytime. Lost connection? The downloader will wait for connection and will resume then downloader without any user interaction. Stream music videos in background. Play personal or YouTube Mix playlists in background. Video player: Bandwidth Adaptive video streaming using Exo Player. Video player: Supports Picture-in-Picture (Android Oreo 8+). Video player: Supports gesture controls. Video player: Supports playing live events. Supports downloading complete playlist (including Watch Later and private ones). 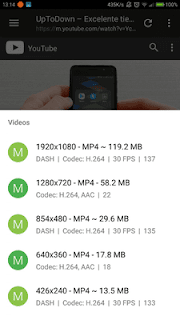 Option to select audio quality manually while downloading DASH videos. 0 Response to "GetTube – YouTube Downloader & Player v0.8.2.0 AdFree Apk is Here!"